These cute country hearts are easy and fun to make using salt dough. Print the pattern above and cut out. Roll out the dough on baking parchment to ½ – inch thick. Cover the dough with the pattern and using a sharp knife cut out the heart. Mark the squares with a pin. Moisten your fingers and smooth the edges of the heart. Indent lines on the heart, following the pin marks, leaning the knife first towards you then away. Cut a paperclip in half and insert it into the top of the heart. Make more hearts in the same way. Place the hearts on a baking sheet lined with parchment paper. Bake for about 2hr at 275 degrees. Allow to cool. When pieces have cooled, paint the heart red leaving alternate squares plain. Allow paint to dry. Seal with five coats of varnish. Thread some raffia through the paperclip loop and tie in a bow. 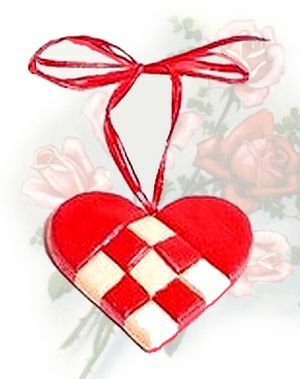 This free valentine craft project is contributed by Heidi Ott, editor of Crafter’s Community.